For many horse lovers, the only real riding is trail riding. Whether on a country road, a beach, or a mountain trail, it's a soul-satisfying chance to connect with your horse and with nature. As you relax, get in condition, and strengthen your communication, every aspect of your horse's (and your own) performance will improve. 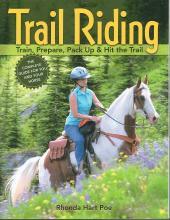 In Trail Riding, Rhonda Hart Poe offers a complete manual of everything you need to know before riding off into the Great Outdoors. You'll learn how to evaluate a trail mount, choose equipment, and pack up. You'll discover ways to train your horse in everything from crossing rivers and encountering traffic to coming when called. You'll learn how to deal with wild animals, unexpected weather, poisonous plants, and trail emergencies from lameness to insect stings. Whether you're riding close to home or trailering and traveling far, camping out or competing, Poe's expert advice will enhance your experiences.